Before the recall election … the liberal media and pundints called this the most important election before the national election. That’s when they thought they could steal the governorship from the people. When they lost … the election is now deemed “unimportant”. The headlines were “Walker Survives” or “Walker Hangs On” … funny, he creamed the opposition. Had THEY won the headlines would have been “WORKER’S WIN” or “PROGRESSIVE VICTORY.” Instead, it is spun as Walker making it by the hair of chinny chin chin. Not true. It was a kill shot to the liberal, labor leftist agenda. Dead! It sends a clear message to the occupant’s of the White House: PACK! 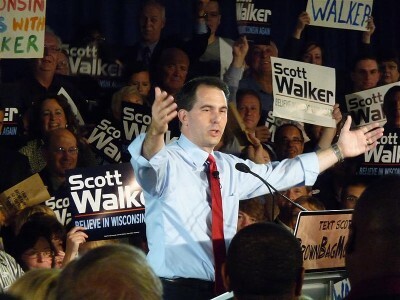 Walker’s win was the voice of the people of Wisconsin to the nation … turn debt into surplus when you rally behind a strong leader who will do the right thing – the tough thing rather than an Obama thingamajig. Liberal’s cannot even agree how to spin this. Some say it was only because the voters don’t agree with recall elections. Other’s say they were out spent (while boasting of how many millions Obama can raise for his own re-election bid). And some lament America is dead. Why? Because the socialist choke hold of the labor movement was slapped back into ancient history. Hey, Dillweed … Democracy was resurrected! A 3.9 billion dollar deficit caused by Liberals and the Labor Left was turned into a 154 million dollar surplus by the Conservative Liberation Movement! Get over it cry baby! This entry was posted on June 8, 2012 at 7:28 pm and filed under Uncategorized. You can follow any responses to this entry through the RSS feed. Responses are currently closed, but you can trackback from your own site.